Ahhh, March! You're here already! I am loving trying to stick with these monthly goals I make... even if they are easy... and turning out to be very similar each month. 1. 5 miles a week (or at least 3 workouts) - CHECK! 2. Try 2 new recipes... Ehhh, sort of. Got hooked on a new recipe for parfaits (thanks Lady) and a new recipe for spinach salads... but nothing gourmet. 3. Moisturize every day - kept up for my face, but I forget sometimes to do my big ol' belly. 4. Do something special with/for TL for our last Valentine's Day with just the 2 of us. - He got sick... but we still celebrated the next day with dinner and tulips! 5. Take Maximus & Zeus for at least 5 walks - check! 1. 5 miles or at least 3 work outs a week. 5. Clean out/organize guest closet. Currently, TL and I are taking some time for R&R. More on that soon :) So excited to be officially (on Monday) in the third trimester of pregnancy with this sweet girl... loving her more and more each day! I love this quote! And I'm always so happy whenever I check in here and see your nursery and read all the latest pregnancy news. I don't always comment but you're in my thoughts and prayers! I feel like your pregnancy has flown by (easy for me to say right)! Enjoy your R&R! I love the quote. Enjoy every minute with your hubby! Congrats on entering the 3rd trimester and keeping up with your February goals... no easy feat when you're growing a human :) I saw on instagram that you guys are in Hawaii... looks stunning! 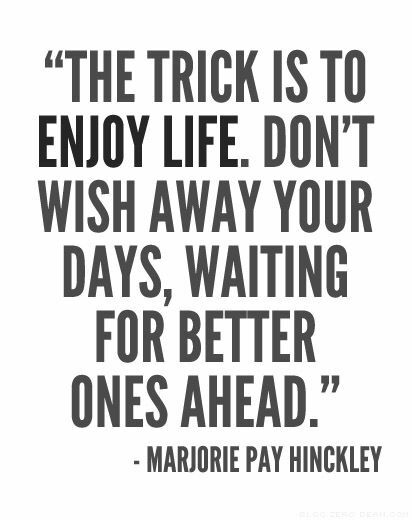 Soak up every moment! These are great goals! :) You can do it!